My sermon from the 10th Sunday after Pentecost (July 29, 2018) on Ephesians 3:14-21. Listen to the recording at the bottom of the page or read my manuscript below. In Provincetown, Massachusetts, there’s a boat sitting inside a building. The building itself is old, a former church that once fit over 900 people in its 128 pews. A large bell tower dominates the front and the sanctuary space overshadows the rest of the town. The building has been many different things over the years. It was an art gallery, a cultural center, and a heritage museum, but it’s now the Provincetown Public Library. And on that library’s second floor is a boat. Now since Provincetown has a long history of ships and sailing, it’s not surprising to find a boat inside its library. We should expect to find lot of boats, models of the various sailing ships that once called Provincetown home. But the boat I’m talking about isn’t a little model. It wouldn’t fit in a bottle and you couldn’t display it on your desk. No, the boat in the library is a half-sized model of a schooner, the Rose Dorothea, that was built in 1905. The original ship was 109 feet long, weighed 108 tons, and had 26 sailors for its crew. The ship was famous for winning the one, and only, Lipton Cup – a race organized by the inventor of the individual tea bag, Sir Thomas Lipton – in Boston harbor in 1907. The Rose Dorothea was low in the water, with a thin central mast, large sails, and a rounded bow which let it zoom through the water. The ship had a productive career, sailing all over the Atlantic until it was sunk by a German submarine in WW1. Rose’s dramatic story became a stand-in for all the fishermen and women and sailors who called Provincetown home. And in 1977, the grandson of one of the sailors who won that Lipton Cup decided to build a half-sized model of the Rose Dorothea inside the heritage museum that was in that old church. 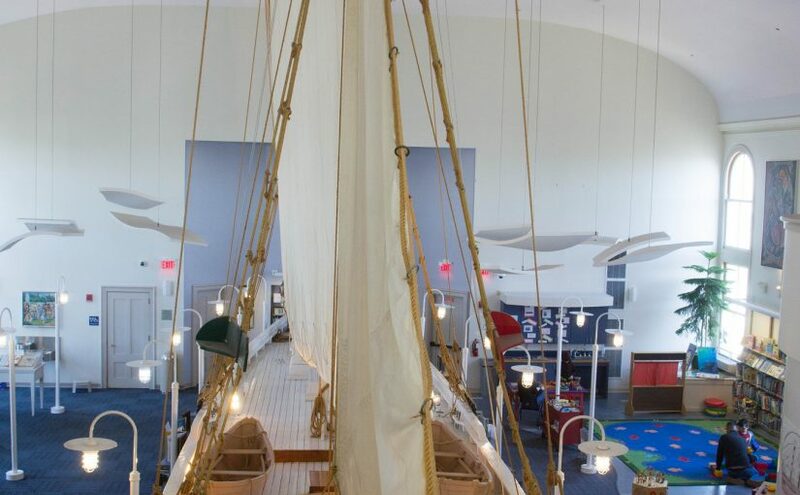 So -today, on the second floor of the Provincetown Public library, is a 66 foot long schooner with full sails and a mast poking through the top of the ceiling. It’s a boat designed to never sail. It has shelves of books around it, blocking it from ever entering the Atlantic Ocean. The boat is just sitting there, a memorial to a way of life that still matters in Provincetown, and with a funny little sign on it that says: Do Not Climb. It’s a bit absurd to build a big boat and keep it inside a building. But this boat is even more odd because it looks as if it could actually sail. I’m not a ship builder but I’ve seen plenty of museum replicas and models in my day. These models are usually small, imperfect, and very dusty. They’re designed to let our us imagine what a real life version of it would have been like. But the boat on the second floor of the Provincetown Public Library looks as if it could sail in the harbor just outside it. The master builder of the model, Captain “Flyer” Santos, was a real life ship builder. He knew what he was doing and he spent over 11 years making sure his team made the Rose Dorothea right. You would think he might have wanted to cut corners during construction because the model would never face a storm at sea. But Captain Santos didn’t because I think he had a story to tell. That ship is designed to invoke memories and feelings in us that we might not even know we have. We’re supposed to marvel at its design and beauty, while at the same time be in awe that anyone would want to sail a little wooden boat across the ocean. We might personally have never sailed or stood on an ocean going ship. But this half-scale model invokes in us a sense of wonder, uniting us with a story that is central to who we are. For many of us, these kind of ships are a part of our own story. We might have sailed across the ocean, passing through Ellis Island as new immigrants to the United States. We might be a descendant of someone who boarded an old rickety sailing ship, hoping to start a new life here in the 17th, 18th, or 19th centuries. Or our ancestors might have been shackled or the ones doing the shackling on the many slave ships that brought so many people involuntarily into this country. Not everyone in the United States is a descendant of immigrants who came from somewhere else or who came to this country willingly. But we, together, have a collective history that is tied to these ships that sailed over the ocean and created this nation along their way. It’s absurd to build a ship inside a building but the feelings, thoughts, and wonder that ship invokes in us, all that good and all that bad; that’s what grounds and root us in our collective story. And that’s why, I think, the author of Ephesians ended the third chapter of their letter with a prayer. Today’s second reading marks the end of the first half of the letter, the part of the letter designed to tell us why it was written. The author was writing to a small community of Christians made up of Jews and Gentiles. And the letter focused first on the Gentiles, the non-Jews, letting them know that they were a necessary part of God’s kingdom. These people who never grew up Jewish were part of God’s plan because God, through Jesus, was uniting all people into a new humanity. This unity, I think, wasn’t supposed to ignore our differences but, rather, the author wanted to focus on what it is that keeps us together. It’s Jesus, this wandering Jewish Rabbi who casted out demons, fed the hungry, and lived a life showing us what it looks like when God comes near – that’s who connects us to each other. It isn’t our nationality or ancestry or history; it isn’t our race or language or gender; it isn’t our wealth or status or even sharing the same exact beliefs – that’s not the focus of why we’re here. We’re here because Jesus called us to be here. We’re connected to each other because, in our baptism, we are connected to the One who makes us one. And we matter to God because all people, in every kind of human family, comes from God. It’s absurd that a Jewish rabbi, killed by the Romans 2000 years ago, would call Gentiles to follow him. But Jesus did that then and he does that still. He calls all of us to cling to him, to follow him, and to know that his absurd love for us will overcome the absurd ways we run from him. We might not always know what that kind of love actually looks like. And we will have questions about what it is God wants from our lives. We’re not going to have every answer to every question that we ask. But we, through Jesus, will receive every answer that we need. In Christ, we are all connected to each other. In the Father, we are rooted to the One who has made all people One. And we, through the Spirit, have been given a faith that will remind us of the many way God is transforming us even when we don’t feel that way at all. Its this faith, grace, and hope that keeps us rooted and grounded in a love that will sometimes call us to do absurd things, like building a boat inside a library, so that all people, knowing who they are and whose they are, can finally see the new future that God is bringing about. Next Next post: Children’s Sermon: Christmas in July is…Absurd. But it matters!